With the advent of smaller and ever faster computing and communications, more computing devices will be embedded in our life artifact. The explicit management of these embedded computers is definitely a burden for the regular person, especially when more than one device is required to complete a single task. 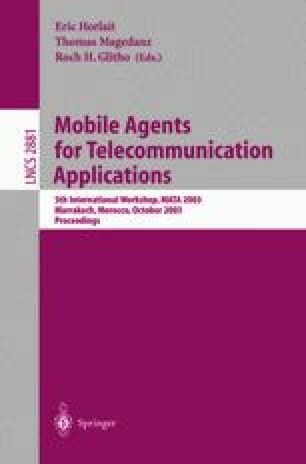 This paper describes an architecture that integrates the use of agent technology, wireless communications and context-awareness to support service and personal mobility. A software agent, running on a portable device, leverages the existing service discovery protocols to learn about all services available in the vicinity of the user. The software agent runs a QoS negotiation and selection algorithm that sets the values for the session configurations parameters based on the session requirements, the user preferences, and the constraints of the devices running the services. The proposed architecture supports also service hand-off between devices to take account of service volatility in case of context change.